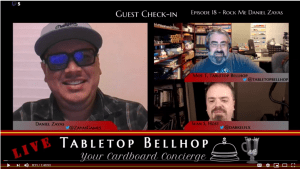 ﻿﻿﻿﻿ This is the 18th episode of Tabletop Bellhop Live, an edited version of our live show recorded on November 28st, 2018. Join us as we stream live every week on Wednesday’s at 9:30 Eastern on Twitch. If you like some video with your audio you can also watch/listen to an unedited version of the show over on YouTube.